In a previous blog post I discussed some of the ways that board games and their terminology have become part of the general culture. However, I think there are more terms and concepts that we could borrow from our favorite leisure activities and apply to everyday life. “The dummy” – Maybe because Bridge is a game most often associated with an older crowd, it doesn’t seem to contribute slang the way other games do. Still, from the first time I was taught the game I found the concept of a dummy player intriguing (though perhaps that was just because it was funny to hear my sweet grandma call someone the dummy). When one team wins the bid, the player who made the bid gets to play while his or her partner simply lays their cards out on the table and, in my family at least, goes to get a drink. This term has all sorts of potential in everyday situations. The dummy player could be the partner who doesn’t contribute any ideas to the team, just resources. The dummy player could be someone who tries to help, but is somewhat following along reluctantly. The dummy player could be someone who shows their hand to everyone so that nothing they do is surprising. Surely, such relationships exist in the social and business world? I’m guessing the term has little chance of adoption, though, since the term “dummy” is so strongly negative even if in this case it refers more to inactivity than mental acuity. “nibs” – In the card game Cribbage, if the first card turned up is a Jack, then the dealer gets two points automatically. This is called scoring for his nibs. Ultimately, this is two points given away for a random event. It seems like nibs could easily stand in for a stroke of undeserved luck. Unfortunately, the word doesn’t sound very “cool” so it probably has little hope of becoming a cultural phenomenon, but it’s still an obscure and interesting way to discuss the concept of good fortune. “You have won second prize in a beauty contest” – This quote from one of the cards in Monopoly is fairly well-known. I’m sure almost everyone has laughed at it when drawing it from the deck for the first time. Really, though, it’s a complex association of feelings. You get $10 dollars for drawing this card, which is usually preferable to going to jail, but the joke is clearly on you since you were runner up in this beauty contest, a beauty contest that likely didn’t draw the most attractive people on earth given the prize money. I’m not totally sure how this would be worked into an everyday conversation – should it be an expression of pity as if to say “you’re far from perfect, but here’s some recognition anyway,” or should it be a way of mocking someone who takes their victory too seriously even though what they won was a joke on them? In any event, the phrase is instantly recognizable and just about anyone would know what you meant even if they had never thought about it before. 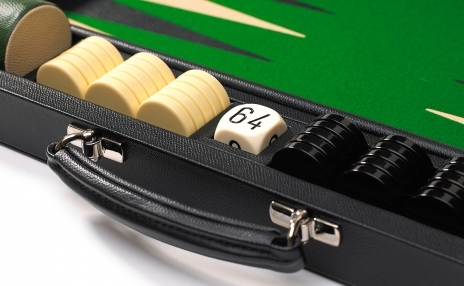 “doubling cube” – A recent casino blog post discusses the wonders of the doubling cube and how it transforms Backgammon into something more like Poker with bluffing and nerves and mathematical calculations. Yet, while Poker is an integral part of our common cultural imagery, Backgammon has barely any connotations to most people. The doubling cube is used to denote the stakes of the current game. So a player can double the stakes at any time. This means a player who is confident of winning might double the stakes to earn more from the win, while a player who fears a loss might double the stakes just to bluff the opponent into backing down. The doubling cube, therefore, is the perfect metaphor for making a last ditch gambit to get out of a bad situation or for trying to maximize the value of your victory. What better way to say your opponent didn’t have the guts to challenge you than by saying “I passed him the cube and he conceded”? Hopefully, games will continue to be more than just a hobby enjoyed by a few but, instead, a common cultural touchstone that even non-gamers can relate to.